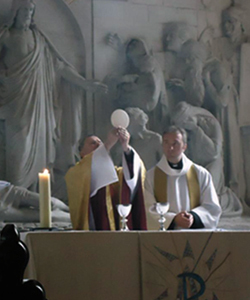 Our acts of worship follow traditional Anglican patterns and are centred on the Eucharist, the foremost act of Christian worship. In our services, we aim to engage all the senses in the worship of God through the varied use of music, vestments, candles and incense. Our regular services follow the schedule shown below and any changes to this will be advertised in the Parish Diary. Come and join us! Our Sunday 'Parish Eucharist', which takes place on the second, third, fourth and fifth Sundays, is the largest service of the week and usually lasts for about 65 minutes. We sing parts of the service as well as the hymns and there is usually a sermon, as well as the opportunity to recall Jesus' command as we celebrate the Eucharist and receive communion. All who wish to receive the sacrament of bread and wine are able to do so. Children are welcome to stay with the congregation but there are toys and an activity area available within the church as well. We are very much a family church and children and families are most welcome. On the first sunday of each month, we hold our 'Family Service', which is a slightly shorter and more informal version of our Parish Eucharist, with a specific focus on our younger members. This service also includes Holy Communion. Tea and coffee are served after the service every Sunday - an ideal opportunity to get to know visitors and regulars alike. Additionally, we hold a 'said' Holy Communion service at 8.30am on the first Sunday of each month. On the first and third Sunday of each month, a service of Holy Communion (according to Common Worship) is held at St. Michael's, Abenhall. The service includes hymns and lasts for about 50 minutes. On second, fourth and fifth Sundays, a service of Evening Prayer (according to the Book of Common Prayer) is held at St. Michael's Abenhall. This lasts for about 45 minutes. It is worth checking the weekly pew sheet in church for any adjustments to our regular schedule. Every Tuesday, Morning Prayer is said at 9am. Then, at 10.30am, there is a short service of Said Holy Communion (according to Common Worship) in the Lady Chapel. This service is ideal for those who can't make it on Sunday Morning or who like something quieter and more intimate. Every Wednesday, you are welcome to join Fr David at our neighbouring parish of Huntley for Morning Prayer with Rev'd Lara. Every Thursday, Morning Prayer is said at 9am. Friday's opportunity for Morning Prayer is at the slightly earlier time of 8.30am.